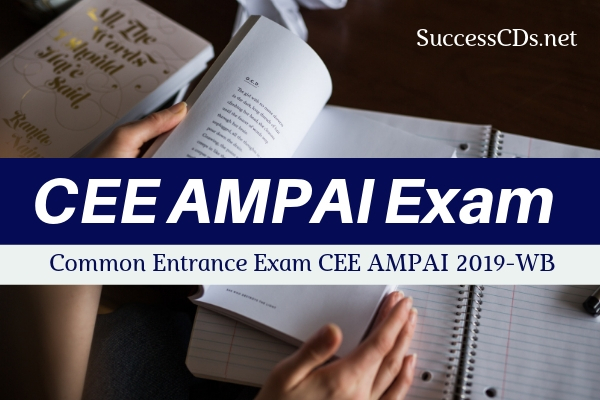 CEE AMPAI 2019 - The Common Entrance Examination (CEE) 2019 will be organised by Association of Minority Professional Academic Institute (AMPAI) for the candidates seeking admission to the various Degree Courses in Engineering and Pharmacy for the academic year 2019-20. Common Entrance Examination (CEE) organised by Association of Minority Professional Academic Institutes (AMPAI) is to conduct an entrance examination for students in the State and National Level. Students of Sikh and Other Minority and Non-Minority in the State and National level may appear in the CEE-AMPAI-2019-WB Examination. This examination will be conducted both for admission in the first year of 4 years B.Tech and B.Pharm Courses. Get here complete details, of CEE AMPAI Exam 2019 including application form, admit card, hall ticket, important dates, fee etc. Mathematics: 9.00 a.m. - 10.30 a.m. Biology: 2.30 p.m. - 4.00 p.m. Date of Birth as recorded in Class X Exam under any School/Secondary Education Board Certificate/Admit Card will only be considered. Individual pass marks in Physics and Chemistry along with any one of Mathematics/ Biotechnology/ Biology/ Computer Science/ Computer Application as Compulsory subjects with individual pass marks (in both theory & practical wherever applicable) in regular mode.